But it’s summer and it’s mighty hot out, so I thought I’d make a lighter version with part coconut milk and part chicken stock. And of course, it’s a great way to use up all that summer squash! The curry is still hot and spicy, but it’s not as overwhelming as the traditional version. I used tofu because I love the way it absorbs the spicy coconut milk, but it would be equally good with shrimp or chicken if you’re tofu-averse. A great way to enjoy one of my favorite winter meals in the sweaty depths of summer. Brown or Jasmine rice to accompany. Heat a large pot over medium. Once it’s hot, heat the olive oil, then add the onions and peppers. Saute for 7 minutes, or until the onions are soft and begin to get translucent. Add the squash, zucchini, tofu and coconut milk and bring to a simmer. While you’re waiting for the coconut milk to simmer, whisk the curry paste into the stock until completely dissolved, then add it to the pot. Let simmer for 10 – 15 minutes, or until the vegetables are soft, but not mushy. Remove from heat and stir in the lime juice and shoyu. Taste and adjust the salt and curry paste to taste. Ladle over rice and sprinkle with basil leaves. Makes 4 – 6 servings, depending on the size of your vegetables. I’m with you – I’m all for eating curries in the heat of summer. There is something so cleansing about eating spicy food when it’s hot outside! This sounds really good! 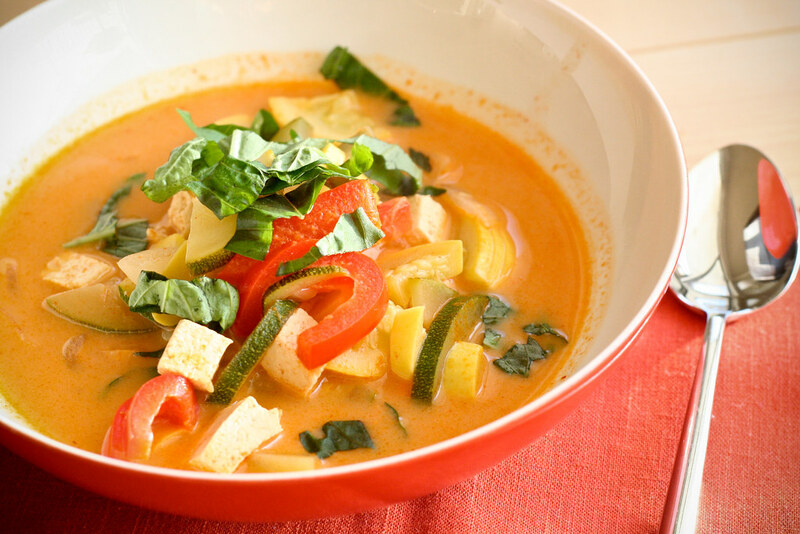 I love a Thai red curry too, good any time of year! This looks like a perfect summer soup! Hey Mel, I learned about your blog through Meli. Everything always looks delicious! I’m planning on making this tomorrow after having red curry for the first time this week. I hope it tastes as good as it looks! Thank you for the recipe. Everyone loved the dish. I have made this 3 times this summer already! Some changes I have made: added diced cooked potatoes and fresh peas which gave me a little bit of the starchy carbs I was craving, and the peas added a POP of color, increased the red curry paste to … ah … like 4 tablespoons! (and I still want MORE heat … ideas?) Cooked the raw shrimp right in the broth. SO yummy. You rock Mel!